World Intellectual Property Day is celebrated annually on 26 April to bring a greater awareness of the role that intellectual property rights, such as copyright, patents, and industrial designs play in encouraging innovation and creativity. Unlike traditional property, intellectual property is intangible. It is far harder to protect one’s intellectual property from infringement or copying than it is to protect physical property. Intellectual property rights are important as, when well implemented, they provide the creator sufficient protection to benefit from their creation, but aren’t so stringent that they prevent widespread use. Intellectual property refers to an individual’s original, intellectual creations, whether that is scientific, artistic, technical, or otherwise. As with other types of property, your intellectual property is covered by certain rights and protections automatically granted to the creator. These convey upon the owner rights over the control and utilization of their intellectual output. Depending on the situation, your intellectual property rights will also be covered by one or more types of protection, varying from patents to trademarks. These types of protection are intended to prevent unauthorized use or piracy of intellectual property, and to confer upon the creator time-limited, exclusive rights to their intellectual output. When you write an article, that type of intellectual output is automatically covered by copyright. This is regulated through the Berne Convention. This convention confers a number of rights to the author, including the right to translate, make adaptations, and make reproductions of a work. Depending on the specific jurisdiction in which a work is created, copyright protection lasts for the lifetime of the creator plus a specific period (circa 50 to 70 years). In terms of producing a scientific article, one of the most important rights conferred upon an author by copyright protections is the right to sell or transfer these rights to another individual. Usually, when an author publishes an article with a journal, they sign a contract ceding their copyright to the publisher. Depending on the individual publisher, the author may retain some rights, such as the ability to distribute an earlier version of their paper and the right to proper attribution. However, the journal now has control of the dissemination, distribution, translation, and reproduction rights, among others. 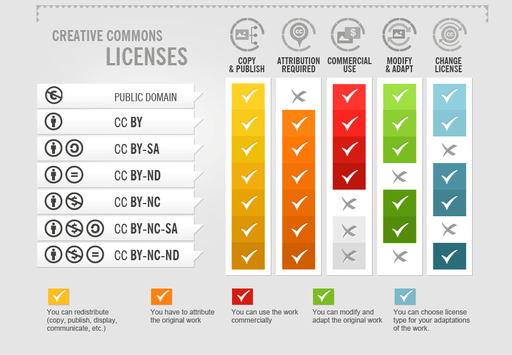 Creative Commons licenses are designed to assist you in keeping your research openly accessible and distributable. For a creative commons license, the author retains all of the copyright, but has licensed their work for use and reuse under different circumstances, depending on the license. When publishing a paper under a creative commons license, rather than transferring the copyright to the publisher, the author instead licenses certain rights to the publisher to allow them to distribute the work. Creative commons licenses run from CC-0, which leaves a work completely free to reuse, redistribute, alter, and utilize in any manner, to CC-BY-NC-ND, which makes a work accessible, but restricts redistribution and commercial use. Similarly some license types employ an additional stipulation known as copyleft. In terms of a creative commons license this is known as share-alike. Essentially copyleft licensing allows people to freely distribute copies and modified versions as long as they adhere to the original licensing. If you wish to make a paper open access, a journal will usually charge an Article Processing Charge (APC). However, the IIASA library maintains agreements with several publishers that allow a work to be made open access without charge. In instances where no waiver is in place, we also have an open access fund from which IIASA researchers can apply to have part of the APC charges paid for.